I recently posted the above picture on Facebook of a coconut stuffed with toys for the toucans to roll around and forage out. One of our toucan friends inquired further as to what we actually stuffed the coconut with. I thought that that was an excellent question and one that certainly deserved some explanation beyond my simple answer in the space-limiting comment field. It has taken us some time to uncover the perfect recipe for a tantalizing toucan toy, but now that we (almost) have it, I’d love to share our shopping secrets with anyone who may benefit – toucan toy maker or not. We hide all of the toy stuffers among natural fillers, so that they take more effort to find. For filler, we use simple materials such as straw, coconut gauze, crumpled brown paper, crunchy dried leaves, or even cut up scraps from older, semi-demolished toys of yor. It often tends to look like a container of rubbish (or so I’ve been told) but it sure is a delight to the toucans, which really, is the whole point. Wooden toys are great because they can be tossed around and make a satisfying clacking noise when being banged around between beaks. You can find wooden spools, balls, and blocks of all different shapes. It took us a few botched orders to finally find the right sizes for the Three-Cans, but now that we have, the blocks are always a favorite find and wind up in their food bowls – a sure sign that they’re considered precious in Toucanland. These are by far the most diverse category of toys available and most of these, unlike our other toys, are in fact, bird toys. We just buy the ones in the extra-small sizes (for canaries and finches) or the parrot foot toys – that way, they are all the appropriate size to be able to be tossed around in a toucan beak. Paco and Pepe in particular will spend days working at dismantling them, braid by braid, which is an excellent boredom buster. Wicker toys are fun because they can be pulled apart with some effort on the toucan’s part, which makes for a nice time-consuming and puzzling mental task. They come in a wide variety of shapes and sizes from hearts to stars to bells to balls.Their favorites are definitely the ones shaped as balls and bells – they have a bit of give and the squishy-ness seems to inspire a motivation to crunch and destroy. Most of the plastic toys we have found that suit the Three-Cans best are those designed as bath or pool toys for babies. They are thick enough plastic where they are pretty indestructible (at least for a toucan) and float in water, which is extra fun when they make the inevitable trip into the water bowl. Due to their affinity for the game of catch, it is not surprising that toucans love to play with balls. I have balls of all different textures from plain mini tennis balls (made for cats) to corn husk balls to soft, stuffed balls. If they make noise, all the better – their favorites are definitely the ones that squeak, jingle, and rattle. Definitely the most beloved of all toys are the stuffed ones. We have ones shaped as mice, birds, fish, and other creatures that appeal to cats because…they are all cat toys. The Three-Cans adore cat toys and therefore, I do too – so long as they don’t have any small bells (choking hazard) or catnip (toxic). Some of ours are also puppy toys that have squeakers, which are popular with Pepe. Just be sure to monitor closely so that as they start to destroy it, you can remove the squeaker before they get to it. The Three-Cans love to toss around wine corks and are partial to their larger cousins, the champagne corks. These are free and I am happy to utilize my champagne-drinking skills to keep them well-stocked. They also enjoy any toys made of coconut pieces, especially the fibrous discs, which are usually a hit. We order most of our toys through Petsmart or Doctors Foster and Smith, mostly just due to our shipping requirements. You can find a wide variety of toys on many other great pet sites as well. Be sure to look beyond the bird section – I often find a good majority of our toys qualified as being designed for cats, ferrets, or even small puppy toys – I like to think of the pet stores as one big toucan section – you just gotta search out the gems. 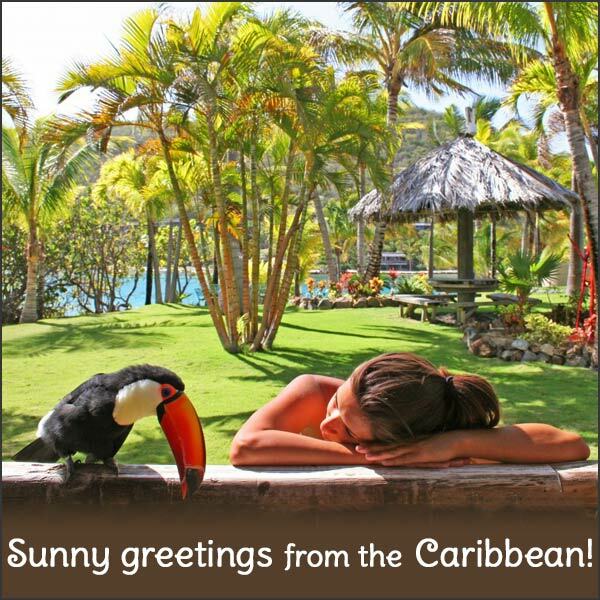 This entry was posted in Enrichment, Lists and tagged Adventures in Toucanland, avian enrichment, bird, birds, BVI, Caribbean birds, enrichment, exotic birds, exotic pets, island, Paco, Paz, Pepe, pet, pet bird, pet birds, pets, Saba Rock, Toco, Toco Toucan, Tocos, Toucan, toucan toys, toucanland, toucans, toy, toys, tropical birds, tucan, tucans by Toucan Lady. Bookmark the permalink. I wonder if they would like the rubber on puppy kongs…. I was delighted to happen upon your website and post. Out of desperation trying to find safe and enjoyable toys for our toco pair, I googled and you appeared with your wealth of information and experience. My husband Peter and I live half the year in Naples, Florida and half on a mountain coffee farm in the interior of Brazil where we have a pair of tocos, Victoria and Albert. Despite the fact that we have toco as well as variety of other toucan and parrot residents eating out wiring and pecking at our windows and tempting motion sensors, our pet pair was bred in captivity. Brazil is very appropriately careful of their native population and it requires extensive documentation and microchip registration to own these funny clown birds. As having them as pets is not the typical, I have no resources in country and am planning to buy what I can in the States to take with me. Your site has such insightful and intelligent and careful suggestions. Many of the items mentioned are available on our farm. It is obvious you know and love your birds and I want to give ours similar experiences. I never would have thought to pull together such creative toys!!! Thank you!! !